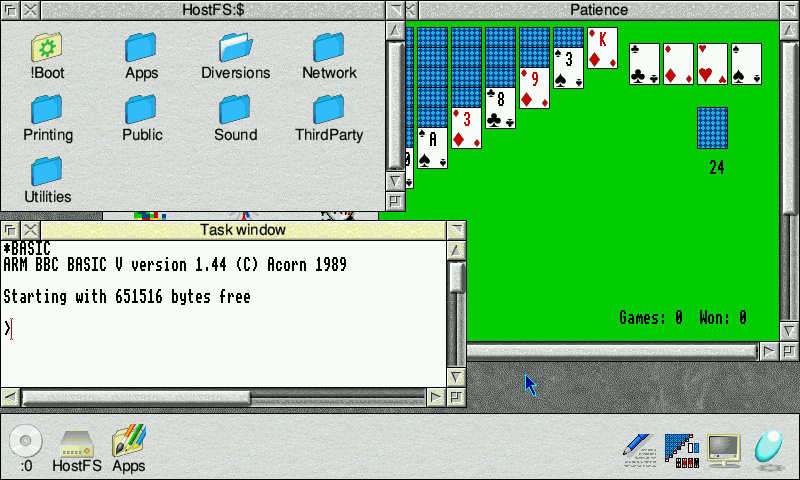 Emulator comes with RISC OS 5.17 and the appropriate boot sequence/hostfs from the Open RISCOS project. The first time it's run it will unpack the filesystem and ROM, these will take a couple of minutes during which nothing obvious will be happening onscreen but the SD like will be on. Once it starts you can press Ctrl+End (Game B button) for menu. Sound does not currently work, this is a limitation of the ROM rather than the emulator. You might have more success with RO 3.6 (working sound, more compatible) but you will need to replace the !boot sequence with something suitable, the 5.17 boot sequence will not work, unfortunately I can supply neither as they're still subject to copyright but if you have a Risc PC you can get them from there. !SparkFS is supplied with the stock hostfs. If you are using 3.6, when you boot the first time it'll fail to run the boot sequence, just select reset from the on-screen menu in the emulator (and set CPU to ARM610, SA110 for 5.17). You might get away with using the newest version of the open RISC OS 5 ROM image too, I've not looked at this in a year or so... I'd imagine at least some progress has been made in the meantime! Although Sibelius might not be the best choice, if sound isn't working!